Powerbox, one of Europe’s largest power supply companies and a leading force for four decades in optimizing power solutions for demanding applications, has won the Power System Product of the Year category in the prestigious Elektra Awards for 2017, run by leading UK magazine Electronics Weekly. At a special awards evening in London on December 6, Powerbox’s Chief Marketing and Communications Officer Patrick Le Fèvre accepted the award from Hal Cruttenden, famous comedian, actor and master of ceremonies on behalf of Electronics Weekly. 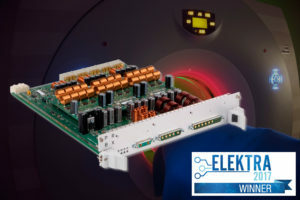 The Elektra Awards’ Power System Product of the year award is presented to the power product that demonstrates technical capabilities and usefulness that differentiate it from competitive products. Judges looked for evidence of product performance presented in numbers and/or design applications. Judging criteria also looked for new topologies and architectures, use of materials, advanced semiconductor technologies and packaging. Powerbox’s winning entry, the GB350, is a 350W buck converter that is used to power equipment in medical and industrial applications such as MRI scanners and particle accelerators. Faced with the challenge of designing a unit that operates actually within an MRI scanner, engineers at Powerbox did away with magnetic cores altogether and created a unit with air-cored inductors. Four-phase switching at 600kHz, a total of 2.4MHz, allows the air cores to work, and a digital processor manages everything from switching parameters to output voltage characterization. The GB350 is a very clever and elegant solution to a long standing but never previously solved problem – a true first. Judges praised Powerbox for its “creative thinking” in solving this thorny problem.